Holding Up or Hanging On? “Hold up yaw sistuh,” my mother said years ago as she posed us for a photograph. But my sister didn’t need my support, even then. Most of my life I’ve hung onto her because I depended on and needed her, and didn’t want her to fly off without me. This past weekend we got together to celebrate her birthday, at my mother’s place. Shortly after we arrived, the conversation turned to last week’s blog post where I’d Photoshopped an age progression on a picture of my daughter who died. “Why do you feel the need to do that?” my mother asked. I am not going to share who said what about letting go, hanging on, moving on, and so forth, in the skirmish that followed. It got me wondering about the differences. Holding up is to keep something from getting away or falling, to keep in high regard, to endure. You’re holding up quite well under the circumstances, I like to hear, as opposed to why do you have to keep hanging on? Hanging on is to hold tightly, to grasp, perhaps in desperation. Hanging on is waiting, persisting with some effort despite difficulties or setbacks. It is clutching at something and letting it lead you who-knows-where, maybe even allowing it to drag you backwards or under. Are you hanging on to someone or something for dear life? Or are you holding up your dearest memories of a most precious one in order to honor her and recycle your love for her into something more. Can you carry the one you love, and thought you lost, into your future even when others are telling you to get over the loss? I’m not saying whose resolve was not budging and who was close to tears defending her position. “I loved your latest post and the age progression photo you did,” my sister said. I shut up and smiled gratefully. She had my back and was holding me up this time. 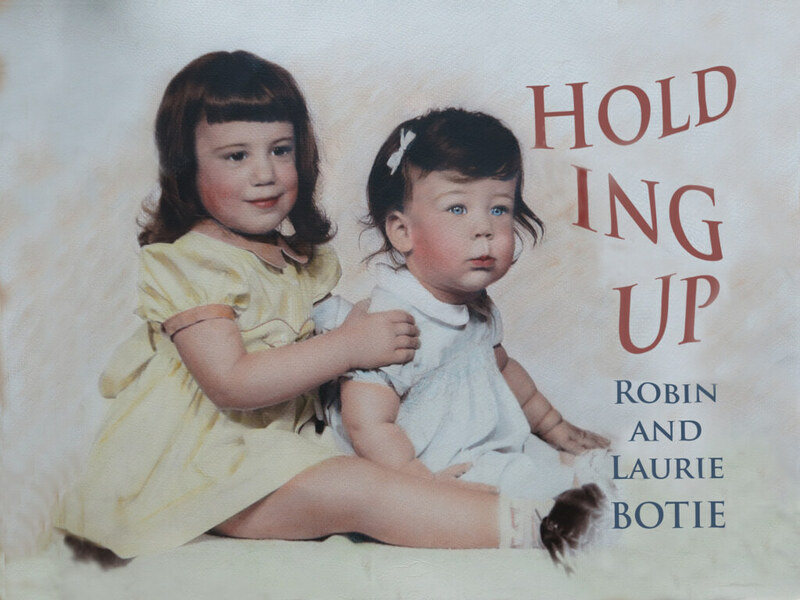 This entry was posted in 2015 and tagged age progression photo, blog post, family arguments, hanging on to grief, holding memories, holding up or hanging on, Photoshop, sisters on 2015/07/20 by Robin Botie. Robin, this is a great distinction and thank you for articulating it so well. When we grieve for someone we never want to forget, we’re often accused of hanging on as though that is a bad thing. If we lived in Japan or many other places, it would be a bad thing to stop remembering the dead. I like the way you experiment with grief and aren’t afraid to show your experiments. I want to remember Vic and hold him up. I write about him a lot and now I’m sharing more of his writing because a friend has made Vic a new website. I’m gathering clips and articles to post in remembrance of him and to honor his work. Keep holding Marika up, Robin. Thank you SO VERY Much, Elaine. Confirmation, affirmation, all of that I am feeling because of your note. Doesn’t it warm you right up to see Vic’s work out there being refreshed with a new site? I imagine it’s like watching him still growing and glowing. Suddenly there’s a place you can point to and say, “There he continues.” Cheers to Vic and to Marika. To all our loved ones we thought we lost. And to you, Elaine, a big hug. You always seem to know what’s in my heart. Hi Ruth. Welcome to my online home. And thank you so much for responding. I’m with you – let’s hold onto our beautiful daughters forever. We can stretch ourselves and our worlds by listening to them and loving the gifts they left us. We can create new chapters of our lives still holding and honoring them. Cheers! I always feel like I’m holding up the best I can, and if it appears to others that I’m HANGING ON, that’s their problem! I need to learn this, Lynne. Thank you. It does NOT have to always be MY problem. Cheers! I totally get this one… So glad u have a sister & mother a part of your entourage. Hi Wendy. So good to hear from you again. Yes, having a mother and a sister, two sisters actually, makes for happy times as well as times that are frustrating, painful, challenging, and mind-boggling. Whoever you have in YOUR entourage, I guess you get that. Thanks for checking in on my site. Hugs!